Spelsbury Parish has a population of around 325, distributed across the communities of Dean, Ditchley, Taston and the village of Spelsbury. The Parish lies within the area that was the Royal Hunting Forest of Wychwood. At Domesday in 1086, the royal forest of Wychwood covered much of what is now West Oxfordshire. Two watercourses, Coldron Brook and Taston Brook merge into the River Evenlode, a tributary of the River Thames. The parish church, All Saints’, in Spelsbury village, is part of the Chase Benefice; the village also has a Village Hall but the village pub, The Chequers Inn, burnt down in 1924; although still shown on some Ordnance Survey maps it was not rebuilt. There are working farms in each of the four communities and several small businesses but the majority of parish residents commute to surrounding towns, or further afield, for services and work. 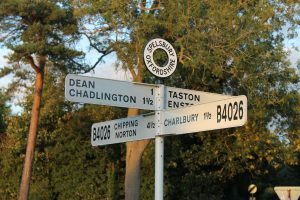 The closest primary schools are at Chadlington, Charlbury and Chipping Norton, and Secondary Schools in Chipping Norton, Witney, Woodstock and Burford.